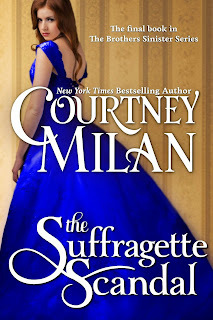 The Suffragette Scandal was my first Courtney Milan and now I'm kicking myself for being so late to the party. This book is... amazing. The writing is so cheekily clever and the characters are perfection. It's one of those books that makes you grateful for the simple act of reading. Free is awesome. She's wild and determined and brilliant and I'm totally in love with her. She'll do anything for a story for her newspaper, especially a story that shows the unfairness of the world. She's not naive and knows the dangers of the situations she willingly puts herself in, but keeps fighting. With a heroine like that, there needs to be a hero to match and Edward well and truly lives up to the job. Edward has the double bonus of being both a bad boy criminal scoundrel and a secret aristocrat - what more could anyone really want in a hero? (the answer is obviously nothing because Edward is scrumptious). It's the dialogue that really makes this a standout read, though. It's witty and touching and I want to quote it all, but instead I'll let you enjoy it for the first time in context. The interactions between Free and Edward are fabulous from the first moment they meet, when they flirt over punctuation - yes, really, and it's as magnificent as it sounds. There's also a wonderful moment when Free calls Edward out for mansplaining (though not in those words, obviously), and it's the best moment ever. There's a great secondary cast, including the other ladies at Free's newspaper and Edward's friends. And also a secondary romance that had me swooning. Usually I'm not a huge fan of more than two perspectives in a romance, but Amanda is my forever exception. Sweet, fumbling Amanda, getting lost in conversations and so confused by social niceties. I just adore her, and her romance with Genevieve melts me. Ah, my heart, just a melted puddle on the floor. If you like historical romance at all, but especially if you like strong heroines and the heroes who love them, read this book. The Suffragette Scandal by Courtney Milan is a historical romance, released July 15 2014.